The Namazga culture of farming towns (Namazga, Anau, Altyn-Depe, Geoksur) was situated on alluvial fans where rivers that flowed off the Iranian plateau emerged in central Asia. Turquoise deposits were found in middle Zeravshan, near the farming colony of Sarazm (founded before ca. 3500 BC). Late Kelteminar (ca. 3000–2000 BC) pottery was found there, and it had turquoise workshops in the desert near Lower Zeravshan, as well as metal deposits of copper, lead, silver, and tin. Turquoise was traded—along with sources in north-eastern Iran—into Mesopotamia, the Indus Valley, and even Maikop. Arsenical bronze is found, but objects show mostly pure copper, while tin-copper appear only rarely if at all. The Bactria and Margiana Archaeological Complex (BMAC), also called Oxus Civilisation (ca. 2200–1450 BC), was a hierarchical society based on intensive agriculture and specialised craft production of metal and precious stone objects for prestige display and long-distance exchange. Their economy based on water management was likely favoured by the aridification event ca. 4.2 ka BP that also affected Europe (Luneau 2019). Immigrants probably came from the northern Iranian plateau to colonise the Murghab River delta, with their early pottery showing similarities with Namazga V-types. They built large towns surrounded by thick yellow-brick walls, with narrow gates and high corner towers. In the centre of walled palaces or citadels, temples were also built (Anthony 2007). The early BMAC colonisation phase was followed by a much richer period ca. 2000–1800 BC, with new walled towns spreading to the upper Amu Darya valley. Trade and crafts flourished in the crowded streets of fortified towns, with metalsmiths making beautiful objects of bronze, lead, silver, and gold, such as metal figures, crested bronze shaft–hole axes with down-curved blades, tanged daggers, mirrors, pins, and distinctive metal compartmented seals (Anthony 2007). A mixed agropastoral economy including cattle and goat emerges in Turan at least ca. 2200 BC, transitioning from the previously prevalent sheep–goat herding economy (Taylor, Shnaider, et al. 2018). Evidence of the appearance of horses in funeral rites and imagery—but never for meat consumption—is seen from ca. 2100–2000 BC, with scattered samples of Sintashta- and Abashevo-type pottery in the Zeravshan Valley. Until that moment, the typical BMAC equids were onagers, as in most of the Near East, and wagons—found in funeral remains—were pulled by cattle (Anthony 2007). The colonisation of the Ili delta in southern Kazakhstan had begun before 2000 BC by groups of hunter-fishermen and early shepherds, possibly semi-settled in niches of the upper course, while the bulk of the Bronze Age findings belongs to a second phase after 2000 BC, with groups already acquainted with seasonal transhumances between summer camps in mountain meadows, autumn and spring transitions across piedmonts, and winter camps in the green alluvial plains of the lower part of the delta system (Deom, Sala, and Laudisoit 2019). The BMAC culture expanded to the Gorgan area of northern Iran, where a horse-drawn chariot is depicted on a cylinder seal from Tepe Hissar III B. Tin–bronze appear especially in Bactria, closer to Zeravshan, after ca. 2000 BC, suggesting an establishment or expansion of tin mines of Zeravshan during this time. With the emergence of tin trade between BMAC and Assyrians from Cappadocia, in the 20th century BC, the horse-drawn chariot appeared in the Near East. This expansion from south-central Asia through northern Iran into the Near East has been associated with the arrival of Mitanni Aryans into Syria (Parpola 2013). Contacts with steppe pastoralists becomes evident ca. 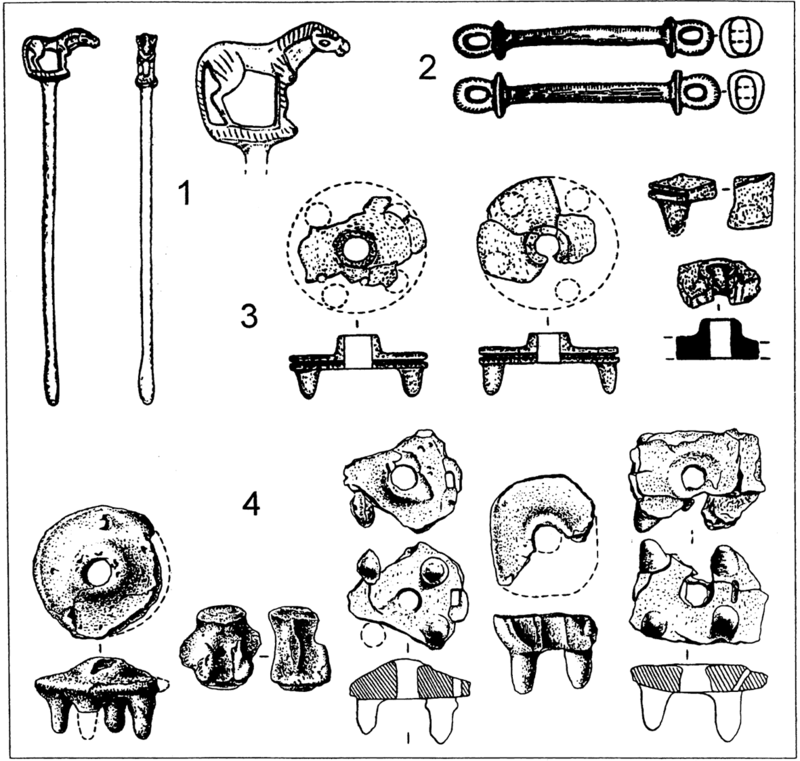 1900–1800 BC, with materials of early Andronovo (Alakul) types among tin miners. Also, an elite grave on the Zeravshan Valley in Tajikistan (Figure 86) shows a horse-drawn chariot with Sintashta–Arkaim-type bits and bone cheek-pieces, as well as a bronze sceptre topped with the image of a horse, but typically BMAC ceramics (Bochkarev 2010). It is likely that Petrovka had a metalworking colony at Tugai already ca. 1900 BC, with steppe tribes eventually taking control of the ore sources of Zeravshan (Anthony 2007). Between 2000–1800 BC, BMAC styles and objects (small jars made of carved steatite) appear in sites and cemeteries across the Iranian plateau, with many elements on the border between the Harappan and Elamite Civilisations suggesting a movement of BMAC peoples into Baluchistan. Chariots were simultaneously introduced in BMAC, Iran and the Near East ca. 2000–1900 BC (Anthony 2007). Figure 86. Materials from an aristocratic burial at Zardcha Khalifa in the Zeravshan Valley. (1) Horse-head sceptre pin of bronze of the same type as those found in Sintashta (4) [not to scale]. (2) two horse bits of bronze. (3) fragments of cheek-pieces of bone. Modified from Parpola and Carpelan (2005), where images from Bobomulloev 1997 and Gening et al. 1992 are used. By 1800 BC, political centralisation fades, suggesting loosening of state-level structures. The late BMAC period (ca. 1800–1600 BC) shows a shift from a tiered system of urban centres, villages and hamlets to a more dispersed pattern of smaller-scale agricultural settlements. Walled towns decrease sharply in size, with each settlement developing its own pottery, and Andronovo–Tazabagyab coarse-incised pottery appearing widely in the BMAC countryside (Anthony 2007). The first evidence of campsites with a distinct ceramic tradition supports an influx of mobile pastoralists from the central Eurasian steppes and foothills—and thus farmer-pastoralist interactions—appearing rather early, at the end of the 2nd millennium BC, but increasing sharply during this period (Rouse and Cerasetti 2018). The increasing number of small campsites suggests stronger interactions with the new agricultural settlements. Mixed pottery found in kurgan cemeteries of the highlands above Bactrian oases in modern Tajikistan (Vaksh and Bishkent). This is a period of combined control of mineral trade (copper, tin, turquoise) and pastoral economy (horses, dairy, leather) in the region, with an eventual social, political and military integration (Anthony 2007). Their common evolution for hundreds of years, with interactions in subsistence economy, technology, and ideology, attests nevertheless also to the lack of assimilation, and thus a conscious attempt to maintain distinct farmer and pastoralist identities (Rouse and Cerasetti 2018). By 1600 BC, a change is seen in access to water—essential for life in the region—in the transition from the Late Bronze Age to the Iron Age (Yaz I), evidence of a political–economic system that was shifting toward territorial management. This period is characterised by a combination of sand encroachment from the north, shifts in known watercourses, and a possible decrease in flows, as well as the invasion of people represented by ‘steppe’ pottery, with declines and abandonment of major population centres (Rouse and Cerasetti 2016). Many settlements of the old BMAC region, as well as trading settlements and outposts in eastern Iran, are abandoned. Sites remaining in the agricultural heartland of the southern Mughab region are campsites with non-Oxus pastoral economy, although some evidence exists as to the persistence of some agricultural activities (Rouse and Cerasetti 2018). Pastoral economies spread across Iran and into Baluchistan, and are followed by the Gurgan Buff Ware (ca. 1100–1000 BC), which appears in south-central Asia, probably an expansion of the Yaz-I related cultures. This is followed by the Late West Iranian Buff Ware, which appeared ca. 950 BC in the regions where Median and Old Persian were first attested (Parpola 2013). BMAC-related settlements expand to the borderlands of south Asia, including the Gandhara Grave culture (ca. 1600–900 BC) around the Swat Valley, the first local culture to have domesticated horses. The horse and chariot are essential in Rigvedic hymns, which were potentially composed ca. 1200–1000 BC in the northern Indus Valley (Parpola 2013). Thirteen individuals of the Chalcolithic–to–Bronze Age urban settlement from Tepe Hissar in eastern Iran (ca. 3700–2000 BC) show homogeneous Iran Neolithic-like ancestry without significant genetic drift over the whole period, suggesting little impact of migrations and a substantial population size. In spite of this, varied haplogroups have been reported, including J2a-M410, T1a-M70, L2-L595, all with connections to the Fertile Crescent area (Narasimhan et al. 2018). Two samples from Sarazm (ca. 3600–3500 BC), and twelve samples of the East Anau group of tribes from the Geoksiur Oasis (ca. 3500–3000 BC), three of hg. J-M304, one of hg. I2-M438, and one of hg. Q-M242, also belong to this Iranian Neolithic-like cluster, and evidence the likely dispersal of tribes from south-eastern Iran. Samples from the Sumbar Valley also show a similar ancestry, from the Eneolithic to the LBA Sumbar culture, in samples from Tepe Anau (ca. 4000–3000 BC), two of hg. R2-M479; from Parkhai (ca. 3500–1000 BC), one of hg. G-M201; and one from Sumbar (ca. 1300 BC), of hg. R2a-M124. A Bronze Age Turan sample from Darra-i-kur (ca. 2700 BC), probably of hg. R1b1a1a-M73, and two from Shahr-i-Sokhta, Iran (ca. 2800–2500 BC), of hg. J2a1-L26, also show similar ancestry (Narasimhan et al. 2018). A cline of Anatolian agriculturalist-related admixture ranging from ca. 70% in Chalcolithic Anatolia, to ca. 33% in eastern Iran, to ca. 3% in far eastern Turan was probably established early, consistent with the spread of wheat and barley agriculture from west to east (ca. 7th–6th millennia BC), which suggests that Anatolian agriculturalists may have contributed to spreading farming economies into central Asia as they contributed to Early European farmers (Narasimhan et al. 2018). Two outliers from Shahr-i-Sokhta, one early (ca. 3100 BC) the other late (ca. 2500 BC), both of hg. J-M304, show a distinctive ancestry found also in a BMAC outlier from Gonur (ca. 2300 BC), with AASI-related ancestry (ca. 14-42%) and the rest related to Iran Neolithic and West Siberian Neolithic, without Anatolian Neolithic ancestry. Based on later samples from the Swat region, these early outliers, so-called Indus Periphery samples, are the best proxies for the population of the Indus Valley Civilisation, with an ancestry formed from Iranian Neolithic migrants—likely originating from an eastern region, given the lack of Anatolia Neolithic-related ancestry—and a population migrating from South Asia (Narasimhan et al. 2018). The admixture of both groups is estimated ca. 4700–3000 BC (Narasimhan et al. 2018), which is consistent with the migration of populations from eastern Iran into territories occupied by AASI-like people causing the emergence of the Harappan Civilisation. The language spoken in the Indus Valley was probably Proto-Dravidian, based on the later finding of this ancestry to the south, and on the dispersal of the culture (ca. 2000 BC) coinciding with linguistic guesstimates of the proto-language. It is unclear if this language was brought by migrants from Iran, or if it was adopted by them from the local AASI-like populations, especially without a proper sampling and reported haplogroups directly from the culture, although the former seems a priori more likely, based on the different languages associated with AASI in south Asia. Sixty-eight individuals belonging to the BMAC culture show a genetic cluster similar to preceding groups in Turan, showing Iran Neolithic ancestry (ca. 60%) with lesser contributions of Anatolian Neolithic (ca. 21%) and WSHG ancestry (ca. 13%), suggesting that the culture emerged from preceding pre-urban populations in Turan, in turn likely from earlier eastward migrations from Iran. A close cluster with little Steppe ancestry is found in thirty-four samples from Gonur Depe (ca. 2300–1600 BC), including three of hg. J-M304, two E1b1-P2, one I2-M438, and one R-M207; seven samples from Dzharkutan (one ca. 2100–1800 BC, six ca. 1750–1450 BC), one of hg. R1b-M343; thirteen samples from the MBA Sapalli Tepe (ca. 2000–1600 BC), two of hg. J-M304, two of hg. R2-M479, one of hg. G-M201, and one of hg. L-M20; and six samples from the Bustan catacomb-type burials of a culture similar to Dzharkutan, but with a complex funerary ritual related to the usage of fire, including one early individual (ca. 1900–1700 BC), of hg. L-M20, and five post-BMAC MBA samples (ca. 1600–1300 BC), three of hg. J-M304, one G-M201 (Narasimhan et al. 2018). Two early BMAC outliers (ca. 2500–2000 BC), one of hg. J-M304, show significant amounts of WSHG ancestry, including one female from a pit, and one female from a large rectangular pit in the ‘Royal Cemetery’. This ancestry comes probably from indigenous populations of the Kelteminar culture, native hunter-gatherers of the region before the emergence of BMAC, and represent thus the most likely donors of the WSHG ancestry present in BMAC (Narasimhan et al. 2018). Substantial Steppe ancestry is found in two outliers from Gonur, a male from a shaft tomb (ca. 2150 BC), of hg. P-M45 (hence potentially R-M207), and a female from a pit (ca. 2050 BC); in two early outliers from Dzharkutan (ca. 2100–1800 BC), both females; and in one individual from Sapalli (ca. 2000–1600 BC), of hg. Q-M242. This clearly documents a southward movement of steppe migrants through the region (Suppl. Graph. 13), with an admixture starting probably at the turn of the 2nd/1st millennium BC (Narasimhan et al. 2018). At the same time as steppe migrants were moving further south, three sites to the north of BMAC showed evidence of significant admixture with Iranian Neolithic-related populations (ca. 1600–1500 BC), suggesting mobility of disintegrating BMAC peoples north and south through the Inner Asian Corridor. Samples include three steppe individuals from Dashti-Kozy, near Sarazm (ca. 1700–1400 BC); one late sample from Kyzlbulak, southern Kazakhstan (ca. 1570 BC), of hg. Q-M242, contrasting with an earlier female (ca. 1680 BC), of Steppe ancestry; and one ancient metallurgist of Taldysay, in central Kazakhstan (ca. 1500 BC), of hg. J-M304, contrasting with another later male from the same site (ca. 1300 BC), of hg. R1a-M420 and Steppe ancestry (Narasimhan et al. 2018). Especially interesting is the temporal transect depicted by Taldysay and Kyzlbulak, suggesting the start and the end to the incursion of Turan-related peoples into the southern steppes. Early samples from the Swat Valley in northern Pakistan (ca. 1200–800 BC) are genetically very similar to Indus Periphery individuals, but harbouring Steppe MLBA ancestry (ca. 22%), which supports the integration of steppe peoples in south Asian groups likely coincident with the appearance of this ancestry in early BMAC samples. Later samples from the Swat Valley of the 1st millennium BC had higher proportions of Steppe MLBA and AASI ancestry, more similar to that found in the modern Indian cline, supporting the intrusion of more Steppe ancestry in the region and additional admixture with Ancestral South Indians (see below). Swat proto-historic graves (SPGT) from the Gandhara Grave culture include twenty-one individuals from Udegram (ca. 1200–800 BC), nine likely of hg. E1b1-P2, two from Gogdara (ca. 1300–900 BC), one of hg. H1a-M69, apart from individuals from sites with similar grave architecture, burial features, and grave furnishing (ca. 1000–800 BC): four from Katelai, one of hg. J-M304, another R2-M479; one from Arkoktila; and four from the southern site of Barikot, one of hg. H-L901. Other samples include nine individuals from Loebanr, one early (ca. 1300–1000 BC), of hg. L-M20, eight late (ca. 1000–800 BC), two of hg. L-M20, one R1b-M343, one R2-M479, one Q-M242, one C-M130; one from Aligrama (ca. 1000–500 BC). Samples from Aligrama also include non-SPGT samples (ca. 970–550 BC), one of hg. G2a-P15, one R2a-M124. Early historic graves of the Swat Valley include twelve individuals from the Buddhist site of Saidu Sharif I (ca. 500–300 BC), one R1a1a1b-Z645, one Q-M242, one L-M20, with one outlier showing mainly Iran Neolithic and AASI ancestry; and five later samples from Butkara (ca. 200 BC – AD 100), including two of hg. J1-L255. While the arrival of R1a1a1b2-Z93 lineages and subsequent Y-chromosome bottleneck in India remains unexplored, the Turan region hosted communities with a majority of hg. R1a1a1b2-Z93 already since the Late Bronze Age, as evidenced by two samples of the late Kayrakkum culture (Ferghana variant of Andronovo) from Kashkarchi (ca. 1200–1000 BC), both of hg. R1a1a1b-Z645 with fully Western Steppe MLBA ancestry. The modern Indian Cline can be modelled as a mixture of two populations, Ancestral North Indian (ANI) and Ancestral South Indian (ASI), none of them existing today in unmixed form, and both contributing a variable amount of the ancestry of South Asians (Reich et al. 2009). ANI can be modelled as a mix of ancestry related to both Iranian farmers and people from the Bronze Age Eurasian steppe, close to Middle Easterners, Central Asians, and Europeans (Lazaridis et al. 2016). The maximum Indus Periphery ancestry found in ANI is ca. 72%, with a population from northern Pakistan, the Kalash, close to the minimum, and Steppe MLBA ancestry (ca. 50%) close to modern eastern Europeans. ASI can be modelled as a mixture of Iranian farmers and AASI, harbouring a minimum of 39% Indus Periphery ancestry, with the closest groups to maximum Indus Periphery contribution found in four Dravidian tribal groups from southern India: Palliyar, Ulladan, Malayan and Adiyan (Narasimhan et al. 2018). Among ethnolinguistic and social groups, there seems to be an influence of north Eurasian admixture (potentially from ancient Indo-European-speaking populations) in forward castes, diminishing in backward castes and Dravidian-speaking peoples (Bose et al. 2017). Using admixture linkage disequilibrium, the Palliyar and the Kalash show that their admixture was largely unformed at the beginning of the 2nd millennium BC, and imply that ASI—and thus the expansion of Dravidian languages—may have formed either with the spread of West Asian domesticates into peninsular India (starting ca. 3000 BC), or alternatively in association with the spread of material culture from the Indus Valley after the Harappan Civilisation declined. This spread to the south-east is also supported by the finding of a higher ratio of AASI–to–Iranian farmer-related ancestry in Austroasiatic-speaking groups in India (like the Juang) than the ASI (Narasimhan et al. 2018), with an early admixture of AASI with a south-east Asian substrate—and prevalent O2a-M95 lineages—suggesting an arrival in the 3rd millennium BC (Tätte et al. 2018), coinciding with hill cultivation systems (Silva et al. 2018). The modern distribution of R1a1a1b2-Z93 lineages shows a clear division between western and eastern subclades, with basal R1a1a1b2-Z93 located east of the Andronovo horizon (Underhill et al. 2015). Whereas the western R1a1a1b2a1a-L657 subclade has an expected peak in the northern part of the Indian subcontinent, broadly coincident with the spread of Proto-Indo-Aryan and Indo-Aryan languages, the eastern R1a1a1b2a2-Z2124 subclade peaks at the core of the Proto-Iranian Yaz culture and East Iranian expansion (of languages related to old Bactrians, Sogdians, and Scytho-Sarmatian peoples). The spread of Iranian to the west into the Iranian Plateau, however, was probably complicated by this region’s higher demographic density, as is the case with the genetic make-up of the Balkans. A quite late expansion of Indo-Aryans from a southern Turan region, suggested by the available ancient DNA samples, is also consistent with the greater linguistic diversity in the Hindu Kush–Himalayan area, including: Burushaski, a language isolate, with a majority of R1a1a1b2-Z93 and R2a-M124 subclades among the modern Burusho people (Thangaraj et al. 2010); the controversial centum nature of the Bangani language or its substrate; the presence of a third Indo-Iranian branch, Nuristani, in the southern Hindukush mountains; and the likely expansion of West Iranian languages from the Yaz core area, to the west of the Hindu Kush. This region seems also potentially at the origin of the distinction between expansions of R1a1a1b2a2-Z2124 to the north and R1a1a1b2a1a-L657 to the south-west (Underhill et al. 2015). The simplified linguistic situation to the south-west, dominated by Indo-Aryan languages, is consistent with the Y-chromosome bottleneck of R1a1a1b2a1a-L657 lineages representing recently expanding Indo-Aryan speakers. Nevertheless, modern populations from the Indus Valley show a high proportion (ca. 41–76%) of South Asian lineages like C1b1a1-M356, H1a-M69, R2a-M124, J-M172, L-M11, or Q-M242 (Pathak et al. 2018; Ullah et al. 2017), which supports the mixture of haplogroups in the expanding early Indo-Aryan community, or their expansion from a south-eastern source. Supporting this interpretation is the distribution of Y-chromosome haplogroups among modern Yaghnobis of the Upper Zeravshan Valley, who show J2-M172 (30%), R1a1a-M198 (30%), R1b1a1b-M269 (23%), and K-M9 (12%), apart from other minor lineages (Cilli et al. 2019). The multiple ANI-related admixture events are probably coincident with population movements associated with the complex caste organisation based on the Indo-European-like varna and indigenous jati systems of social stratification. Whereas the prevalent presence of R1a1a1b2-Z93, especially R1a1a1b2a2-Z2124, among modern populations of Xinjiang—who also show typical central Asian lineages—may support the early expansion of Indo-Iranian or Iranian peoples from the east, the finding of R1a1a1b2a1a L657.1 (ca. 8%) in the western site of Dolan (Liu et al. 2018) may be related to a recent expansion of the Indo-Aryan Gāndhārī to the region.